Get vintage copper Gooseneck Barn Lights from Lighting By Hammerworks. 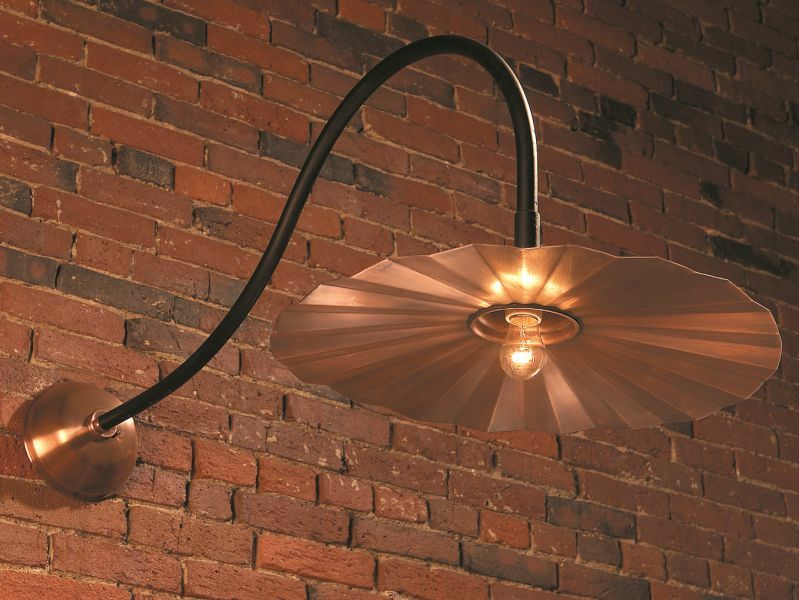 Gooseneck Lighting Model SL503L features a handmade solid copper fluted shade & wall canopy. In addition we offer a choice of solid brass or verdigris finish. Furthermore the steel arm is powder coated black resulting in an attractive contrast. Not only that you can choose between either the fluted “pie plate” round or cone style shades. Therefore if you prefer the cone shade consider the Gooseneck Style Lighting SLS506. No matter what since we offer these unique fixtures in a variety of sizes and arm configurations you have multiple options. Most importantly Gooseneck Barn Lights have many residential uses in contrast to storefront lighting. Consequently both the smaller Gooseneck Barn Lighting SL503S as well as the SL503L Gooseneck Barn Lights are an excellent choice to illuminate a variety of primary outdoor areas. Thus in addition to barn or garage lighting they are a great way to light up a deck or patio. Most noteworthy Interior Gooseneck Lighting adds a dramatic effect throughout your home. The Pendant Fluted Shade Light SLS509 is ideal task lighting. Simply group some together over kitchen counters, islands, and even bathroom vanities. Similarly restaurants often use them over salad bars or booths. Not only that create a dramatic statement with gooseneck lighting over a pool table. Also Gooseneck Doorway Lighting SLS508 is a unique selection anyplace wall lighting is needed. Thus from interior commercial applications to contemporary kitchens and beyond Gooseneck Sign Lighting provides a unique option for any lighting design scheme. In conclusion it is evident solid copper or solid brass Gooseneck Barn Lights offer a variety of solutions to your lighting needs. In addition to outdoor sign illumination, other uses range from outdoor home, barn and garage doorways to kitchen, bathroom or pool table lights.